Rooflights, skylights and atriums provide an excellent method of introducing natural light in to any room that permits. Glass rooflights tend to be less obstructive than windows or facades, whilst offering greater flexibility when designing the room. We are able to provide standard geometries such as mono pitched, dual pitched, walk on, barrel vaulted, pyramid, conical, domed and lantern rooflights whilst also being set up to offer fully bespoke solutions to meet your requirements. All of the shown can be supplied in patent glazing, silicone/structural glazing and frameless glazing options. 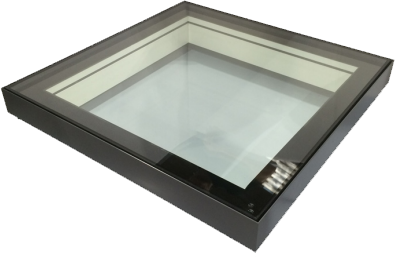 We specialise in the supply of oversize glass unit rooflights, with glass unit sizes easily supplied up to and in some case in excess of 4.8m x 2.75m. We can also supply and manage the necessary contract crane lifts and required logistics associated with this type of specialist work. The Rooflight Solutions mono pitched rooflight incorporates a bespoke thermally broken in-house designed aluminium perimeter framework which is designed to sit over a pre-manufactured builders work upstand which should incorporate a fall of 5⁰, thus creating uninterrupted views and maximising the natural daylight to the room below. The framework is supplied in a hard wearing and low maintenance dual colour polyester powder coated finish (RAL 7015 external, and RAL 9010 internal), and is installed with a high specification double glazed unit incorporating warm edge spacers and low e glass. The glass unit is factory bonded into the frame, all to create a flush silicone filled external surface free from any water or dirt traps. The Rooflight Solutions roof vent incorporates a bespoke thermally broken in-house designed aluminium perimeter framework which is designed to sit over a pre-manufactured builders work upstand with should incorporated a fall of 5⁰, thus creating uninterrupted views and maximising the natural daylight to the room below. The framework is supplied in a hardwearing and low maintenance dual colour polyester powder coated finish (RAL 7015 external, and RAL 9010 internal), and is installed with a high specification double glazed unit incorporating warm edge spacers and low e glass. The glass unit is factory bonded into the frame, all to create a flush silicone filled external surface free from any water or dirt traps. 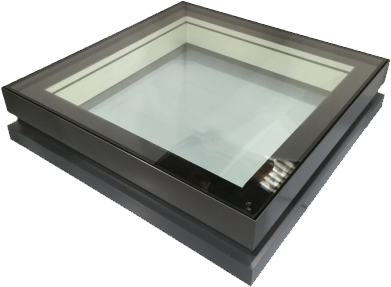 Rooflight Solutions are pleased to introduce our Mono Pitched Sliding Rooflight. The rooflights offers a cost effective and aesthetic solution to increasing the natural daylight and controllable ventilation to any space, whilst maintaining a contemporary design and high quality product. The sliding vent incorporates a bespoke in-house designed thermally broken perimeter framework, which sits over the upstand creating an uninterrupted view and maximising natural daylight. The frame is supplied in a hardwearing and low maintenance polyester powder coated finish, and installed with a high specification warm edge double glazed unit. The glass unit is factory bonded into the frame creating a flush silicone filled external surface free from any water or dirt traps. 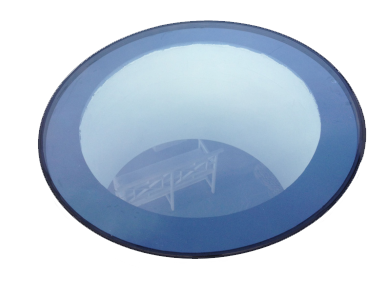 Rooflight Solutions are pleased to introduce our Triple Glazed Mono Pitched Rooflight within our standard products. 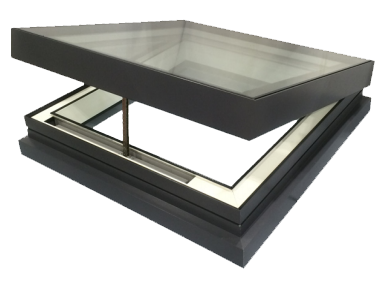 The Triple Glazed Mono Pitched Rooflight offers a cost effective and aesthetic solution to increasing the natural daylight to any space, whilst maintaining a contemporary design and high quality product. The Triple Glazed Mono Pitched Rooflights incorporate a bespoke in-house designed thermally broken perimeter framework, which sits over the upstand creating an uninterrupted view and maximising natural daylight. The frame is supplied in a hardwearing and low maintenance polyester powder coated finish, and installed with a high specification warm edge double glazed unit. The glass unit is factory bonded into the frame to create a flush silicone filled external surface free from any water or dirt traps. The Rooflight Solutions Circular rooflight incorporates a bespoke thermally broken in-house designed aluminium perimeter framework which is designed to sit over a pre-manufactured builders work upstand, thus creating uninterrupted views and maximising the natural daylight to the room below. The framework is supplied in a hardwearing and low maintenance dual colour polyester powder coated finish (RAL 7015 external, and RAL 9010 internal), and is installed with a high specification double glazed units incorporating warm edge spacers and low e glass. The glass unit is factory bonded into the frame, all to create a flush silicone filled external surface free from any water or dirt traps. The Rooflight Solutions walk on glass rooflight incorporates a bespoke thermally broken in-house designed aluminium perimeter framework which is designed to sit over a pre-manufactured builders work upstand with should incorporated a fall of 1⁰, thus creating uninterrupted views and maximising the natural daylight to the room below. The framework is supplied in a hardwearing and low maintenance dual colour polyester powder coated finish (RAL 7015 external, and RAL 9010 internal), and is installed with a high specification double glazed unit incorporating warm edge spacers and low e glass. The glass unit it is factory bonded into the frame, all to create a flush silicone filled external surface free from any water or dirt traps. Our rooflights are designed to accommodate a normal domestic floor load of 1.8kN/m2 UDL and a 1.4kN point load, we are able to accept other floor loads but please check with our office first. The Rooflight Solutions Glass Walk On Glass Floors incorporate a bespoke thermally broken in-house designed aluminium perimeter framework which is designed to sit over a pre-manufactured builders work upstand with should incorporated a fall of 1⁰, thus creating uninterrupted views and maximising the natural daylight to the room below. The framework is supplied in a hardwearing and low maintenance dual colour polyester powder coated finish (RAL 7015 external, and RAL 9010 internal), and is installed with a high specification double glazed unit incorporating warm edge spacers and low e glass. The glass unit it is factory bonded into the frame, all to create a flush silicone filled external surface free from any water or dirt traps. 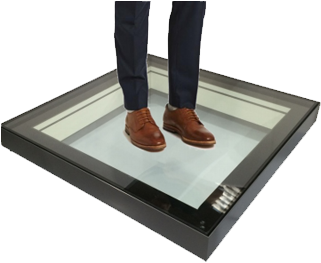 Our Walk On Glass Floors are designed to accommodate a normal domestic floor load of 1.8kN/m2 UDL and a 1.4kN point load, we are able to accept other floor loads but please check with our office first. 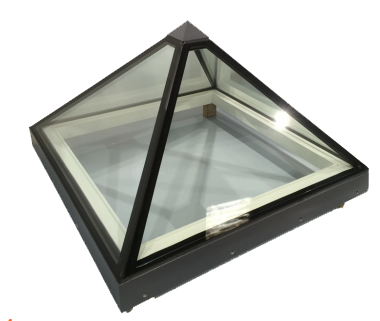 The Rooflight Solutions Pyramid rooflight incorporates a bespoke thermally broken in-house designed aluminium perimeter framework which is designed to sit over a pre-manufactured builders work upstand, thus creating uninterrupted views and maximising the natural daylight to the room below. The framework is supplied in a hardwearing and low maintenance dual colour polyester powder coated finish (RAL 7015 external, and RAL 9010 internal), and is installed with a high specification double glazed units incorporating warm edge spacers and low e glass. The glass unit is factory bonded into the frame, all to create a flush silicone filled external surface free from any water or dirt traps.